Brookshire Grocery Co. has a rich history dating back to 1928 when Wood T. Brookshire opened a small, 25-ft. x 100-ft. store in downtown Tyler, Texas. In the beginning, Wood was in a partnership with five brothers operating under the “Brookshire Brothers” name. In 1939, the partnership dissolved and Wood became the sole owner of three stores in Tyler that serve as the cornerstone for today’s Brookshire Grocery Co.
From left, S.W. “Woody” Brookshire, Bruce Brookshire and W.T. Brookshire (founder) in 1969. Wood founded the company with a foremost concern for the well-being of others, and his dedication to his business and to his customers are characteristics that continue to influence the company today. The company had the distinction of operating the first air-conditioned grocery store in East Texas. It opened in Tyler in 1939. As the company grew, more stores continued to open across East Texas, and Brookshire’s opened its first grocery warehouse in 1953. Today the company operates three distribution facilities—two based in Tyler, Texas, and one in Monroe, La.—with more than 2 million total s.f. and a company fleet of 73 tractors and more than 300 trailers. 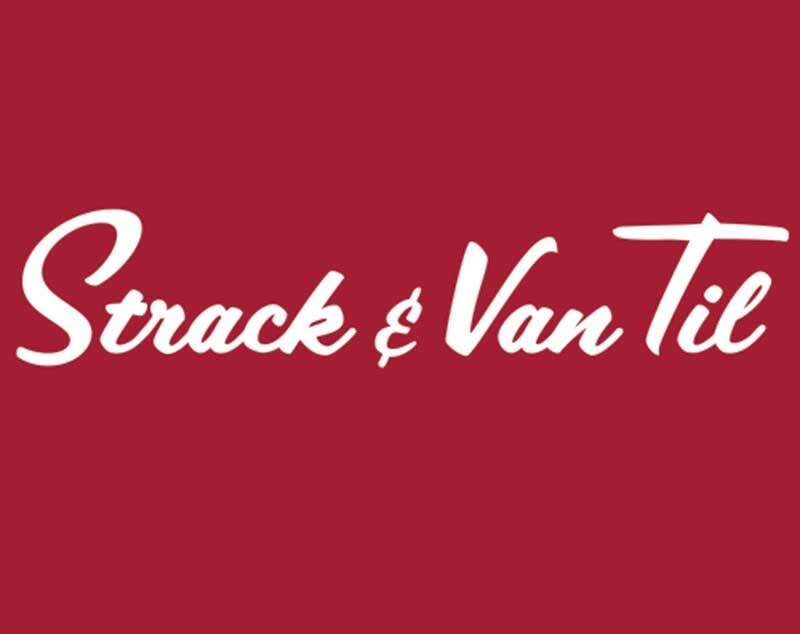 Through the years, the company continued to experience steady growth and expanded across state lines into Louisiana and Arkansas, bringing the service and quality of Brookshire Grocery Co. to more areas. Mrs. Louise Brookshire, wife of founder Wood T. Brookshire, with sons Woody and Bruce. 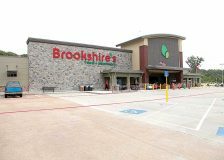 • Brookshire’s Food Stores—The company operates more than 100 of these full-service supermarkets, which are focused on excellent customer service and high-quality fresh meats and produce. 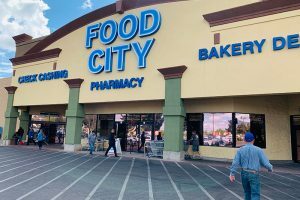 • Super 1 Foods Stores—There are close to 50 of these full-scale supermarkets focused on high-quality fresh meats and produce, value pricing and helpful staff and service. • FRESH by Brookshire’s—A destination market specializing in natural, organic and chef-prepared foods with cut-to-order meats, specialty cheese, local produce, an artisan baker, fresh flowers, patio dining, live music and the best selection of wine and craft beer in East Texas. 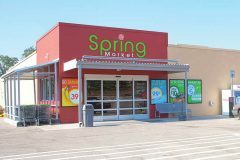 • Spring Market—The company’s newest banner, established in 2016, offers a full shopping experience, great prices and a focus on community involvement and superior customer service. Brookshire Grocery Co. is moving forward toward an exciting future, guided by the core values it was founded on in 1928. W.T. Brookshire believed the grocery business was his calling to serve others, and service continues to be the company’s driving force. Brookshire Grocery Co. (BGC) has of late grown in bounds and leaps. This year, it is opening seven Super 1 Foods stores in locations that it acquired from Winn-Dixie. In 2016, the Texas-based grocery company opened 25 Spring Markets after acquiring former Walmart Express stores. The Super 1 Foods banner, which has been in operation for more than 30 years, continues to grow. Super 1 Foods stores are known for their everyday low prices, quality fresh meats and produce, along with excellent customer service. BGC’s first Super 1 Foods store opened in Alexandria, Louisiana, in 1984. In 2017, four Brookshire’s Food Stores in Pine Bluff, Arkansas, along with two in Natchitoches, Louisiana, and one in Marshall, Texas. were converted to the Super 1 Foods banner. 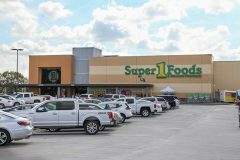 The most recent Brookshire Grocery Co. acquisition of eight Winn-Dixie stores from its parent company Southeastern Grocers will be incorporated into BGC’s Super 1 Foods banner. The announcement was made in February 2018. All of the stores are in South Louisiana, in New Roads, Breaux Bridge, Franklin, New Iberia, Abbeville, Crowley, Rayne and Eunice. One of the things customers love most when they walk through the doors is the long “Wall of Values” with super savings and hot deals on popular national and store brand items. When all of the store conversions are completed, customers will want to look for in-store “Super Shockers,” with “shockingly” low-priced items available while they last, along with “Treasure Buys,” “Dollar Stretchers” and large bonus packs to help feed families for less. In the fresh meat department, customers find meat that’s cut and ground fresh daily, along with monster combo packs, super packs, fresh-cut pork and Angus beef. The produce departments feature locally grown produce. The full-service delis have grab-and-go meals and the bakeries offer fresh-baked breads, pastries, cookies and cakes that can be custom decorated. One of the reasons customers can find so many products for less at Super 1 Foods is because the stores are able to buy by the truckload from distributors and pass the savings on to customers. The stores’ own brands of products offer great quality at super low prices as well. In fact, customers can expect to save up to 40 percent every day on products with the ValuTime label when compared to national brands. In addition, Super 1 Foods’ discount pharmacies offer a generic prescription program that includes select antibiotics for free and low prices on other generics. The pharmacies also offer great quality and low prices for TopCare brand products and fast, friendly service every day. The name “Spring Market” is a tribute to the company’s 90-year history, when founder W.T. Brookshire opened his first store Sept. 1, 1928, on Spring Avenue in downtown Tyler, Texas. The 25 Spring Market stores opened in Texas and Louisiana in 2016. Partners from all over the company worked together to transform the 25 former Walmart Express stores to the company’s newest concept in just a few short weeks beginning in late July 2016. Spring Market is a distinct brand with a format designed uniquely for this new market. These stores offer many of the same products as BGC’s other brands, including produce, market, dairy, bakery, grocery, health and beauty care items. Each location includes a fuel center, and some stores sell beer and wine. When the 25 new stores opened, it brought Brookshire Grocery Co.’s store count to 177, the most in the company’s history. Brookshire said at the time that the company would not stop there. 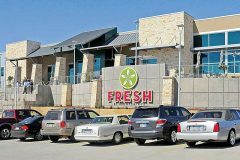 Brookshire Grocery Co.’s upscale FRESH by Brookshire’s store located at 6991 Old Jacksonville Highway in Tyler got a refresh in 2017. Additions include a hot bar, Neapolitan-style pizza and Ramen and Pho bar. The new hot bar and Ramen and Pho bar are located in the chef-prepared area of the store. The hot bar serves as a simple meal solution for guests with an array of hot foods ready on the spot. Offerings range from lasagna to General Tso’s chicken with the selection changing daily. Shoppers can choose from six varieties of pizza or build their own. Shoppers also can enjoy four varieties of Japanese Ramen and two varieties of Pho, a traditional Vietnamese soup with rice stick noodles. FRESH’s hand-crafted sushi also was relocated to the Ramen and Pho bar. Brookshire Grocery Co. has been updating its Brookshire’s Food & Pharmacy locations, including one in Haughton, Louisiana, and stores in Kilgore and Midlothian, Texas. The store in Haughton got a modern design with a new storefront and a relocated entrance, all complemented by new exterior brick and natural stone accents. 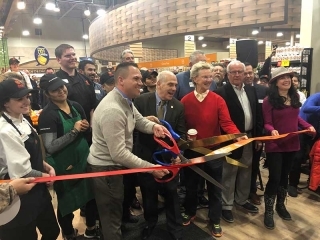 Inside, the store was refreshed with new signage, paint, décor and lighting, and includes many energy-efficient and sustainable features. As they are refreshed, BGC is adding amenities, such as sushi bars as well as an expanded variety of organic produce, imported cheeses and craft beers. Some also get new service meat and seafood counters and reimaged bakeries. The Midlothian store now has a bulk foods section, and the Kilgore location received a sit-down area for in-store dining. The stores also now have additional energy-efficient and sustainable features. Expanded pharmacies now have drive-thru lanes and offer national brand and generic prescriptions, along with a full selection of over-the-counter medications and health and personal care products. The generic prescription program provides savings on 30-, 60- and 90-day generic prescriptions. BGC celebrates these grand reopenings with activities for children, product sampling and sometimes live local radio station broadcasts. Brookshire Grocery Co. Chairman of the Board and CEO Brad Brookshire has more than 40 years of experience with the company. He currently serves on the board of directors for the Food Marketing Institute and for Topco Associates, and he previously served on the National Grocers Association board. Brad is the grandson of company founder, Wood T. Brookshire. Question: What is your earliest memory of the company? Answer: I remember going to the old warehouse in downtown Tyler, Texas, and seeing bales of sugar stacked to the ceiling. In the summers when my dad (S.W. “Woody” Brookshire) was a district manager, I would ride with him all day on store visits. While he did his job at each store, they would put me to work in the produce department shucking onions. Q: In your opinion, how are family-owned grocery companies different from other independent and chain retailers? What makes the family business tick? A: We are in a share group with four other regional family grocers, and this business is in our DNA. We have more of a passion for the industry and care about the people. My hope is that our employee-partners feel like part of the family and know they are more than just a number to us. As family grocers, we also support our communities on a higher scale than the major chain stores. Q: What do you think Wood T. Brookshire would think of today’s Brookshire Grocery Co.? A: I think he would be proud that we are still a family-owned, viable, regional grocery company. I think he would be proud that the company is still guided by the core values he instilled. Q: What do you remember about him? A: He was an iconic grandfather figure. Everybody knew him and he treated everyone the same. He had a huge passion for the company and deeply cared for the store directors and employees. He was one of those people you meet and never forget. Knowing all the obstacles he faced and overcame through the decades, my grandfather is a huge hero to me. Q: Do you believe that the company has held to the values of its founder? A: Yes, and we have been focused on getting back to our founder’s mentality and the foundation that he built for us. Every day, we talk about our core values in meetings and we recognize people for exemplifying them. We are getting back to what brought us this far and will lead us into the future. Q: What legacy do you hope to leave? A: I hope to leave the company in a much better place than where I started as CEO in 2015. I want to leave it with more opportunities for our people, with stores that are in better shape and the customer-experience at a higher level than where it was. Q: What is the best thing about being in the grocery business? A: I really enjoy continuing our family business, and especially now, working with my son, Trent, to move our company forward into the future. Q: What does Brookshire Grocery Co. do best in your opinion? A: Service, and by “service,” we mean approaching everything we do with a servant’s heart. It’s how our employees serve our customers, the people we work with, our suppliers, our company and communities. Each year, our employees contribute well over 20,000 hours volunteering in our communities. Vendor-partners support Brookshire’s Benefit Golf Tournament, which raises more than $500,000 each year to support causes we care most deeply about: education, hunger relief, family well-being and military personnel and local first responders. Our FRESH 15 and Heroes Run races also raise awareness and tremendous funding for charities. Through our Heroes Flight program, we’ve had the honor of taking over 420 World War II veterans on an all-expenses-paid trip to see their memorial in Washington, D.C.
Q: Where is Brookshire Grocery Co. headed in terms of technology? A: We’ve launched online shopping in our FRESH by Brookshire’s store and will be expanding to other banners soon. We recently rolled out an inventory management system with computer-assisted ordering and are developing a new point-of-sale system. Q: Tell us how you keep your team members (whether or not they are store employees) engaged every day. Also, how do you help new hires “get” Brookshire Grocery Co.’s values? A: Last year, we clearly defined our core values and have an ongoing campaign to ensure that our decisions and actions are guided by these principles. We have shared them with our vendor-partners. In every store and area of the company, we begin meetings with an overview of our values. We make them part of our onboarding process and recognize employees for actions that embody our values. As EVP, corporate development, Trent Brookshire oversees Brookshire Grocery Co.’s logistics, real estate, pharmacy and facility services areas. He has served in the company for 15 years, working his way up through retail to lead the Brookshire’s divisions of more than 100 stores. Trent serves on the company’s board of directors, as well as the board of directors for the National Grocers Association. He is the great-grandson of the founder and represents the fourth generation of the Brookshire family in company leadership. Answer: My earliest memory of the company is attending Super 1 Foods grand openings in Louisiana with my father in the mid-1980s. Our first Super 1 Foods store opened in Alexandria, Louisiana, in 1984. Today, we operate close to 50 stores in this format, which offers everyday low prices, great value and fresh meats and produce. A: The word “family” really says it all. In a family, there’s a level of authentic care that cannot be manufactured or replicated. At Brookshire Grocery Co., that care extends to our employees, our vendor-partners, our customers and the 150 communities we are proud to be a part of. A family business offers a level of heartfelt care for people that no national or international corporation can compare to. A: I believe our company’s founder would be really proud that his vision of serving others through the grocery business is being carried out today by our nearly 14,000 employees. Ninety years after he founded our company, W.T. Brookshire’s passion for service is still at the heart of who we are and how we operate as a company. Q: What made you want to be in the grocery business? A: I realized that the unique opportunity I had to work closely with my father in the family business also offered a fascinating career path. After joining the company, I recognized very quickly that I love working with the incredible people of our company. It is a good fit and something I truly enjoy. I love serving customers and trying to become better and make our company better every day. Q: What is your favorite memory with the company? A: My favorite moment as a store director was being part of the many promotions and career advancements of people who mean a lot to me. It is extremely rewarding to participate in the career paths of truly talented people and watch them grow in their capabilities and impact. Q: In your opinion, what is the No. 1 challenge facing the grocery industry today? A: One of the biggest challenges facing the grocery industry today is the pivot toward online shopping, which forces us to be more compelling inside our stores. Q: Which challenges are unique to independent grocers like Brookshire Grocery Co.? A: Scale, talent and vendor-partner resources are all challenges that independent grocers face. Q: What have you learned in the past year that will inform decisions you make in the coming year? A: We have learned a lot about customers’ continually-evolving expectations as technology changes and impacts their shopping behavior. The world continues to become a smaller place, which makes us even more focused and thoughtful on becoming an exciting and engaging place to shop. Q: What is your vision for the future of the company? A: My vision for the future of our company is for our stores to keep getting better to the point we are best in class, not only in our current markets but in many more to come. Brookshire Grocery Co. Completes 14th Heroes Flight To Washington, D.C.